Most things are simple once you think of it. This one is embarrassingly simple but if you are like me, you like to over-stuff everything. 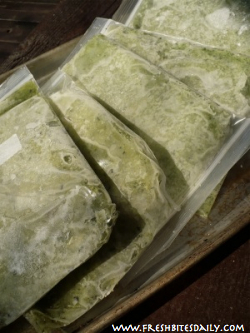 If you over-stuff a freezer bag you have to use fewer of them, right? That may be the case but you will also use more freezer space and end up with a frustrating mess. Fill your quart-sized bag with about two cups of your freezer stash. Two cups is a good amount for most recipes. It will already be measured for you. In addition, your bags will actually stack. When your ingredients are still fresh, fill the bag and then flatten the contents. You will have an orderly stack of food in your freezer which is more likely to stay neatly stacked through the winter. For information on freezing specific foods, check out freezing zucchini, freezing greens, and freezing peppers. How to make and USE eggplant puree. Your blueprint. Freezing apples! Which to freeze? Do you add lemon? 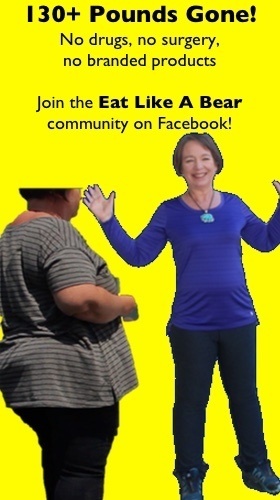 Inquiring minds…. 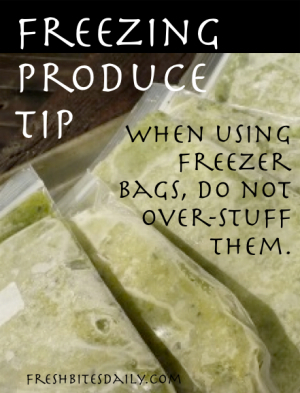 3 Comments on "Freezing Produce Tip: Don’t Over-Stuff the Freezer Bags"
The bags don’t have BPA, just all of the other stuff people are trying to get out of their kitchens. Our freezer is the last bastion of plastic in the house. It all depends on what you’re freezing. In the picture is grated zucchini which needs to be frozen in something. You could turn it into zucchini bread and freeze that but then you’d have a bunch of bread in your freezer. How DO you get those spices out of your coffee mill? Thaw your turkey safely — Don’t get more than you bargained for!